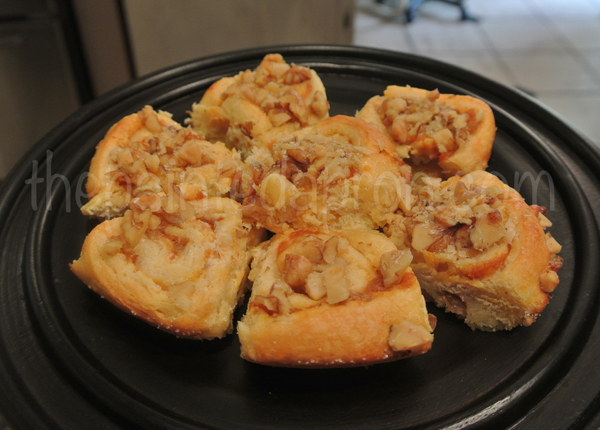 These little sweet & savory bites are so perfect for any occasion this Fall season! Breakfast, Brunch, luncheon, dinner, dessert…I made them to serve with late afternoon cocktails…they are light, not too sweet, delicious and small enough not to be sinful! 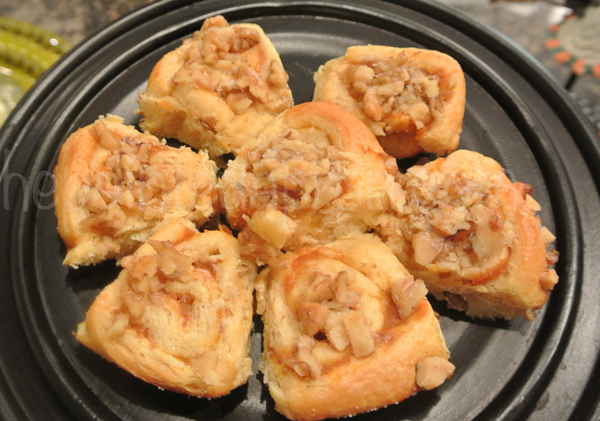 These rolls would make a great hostess gift, or an addition to a pot luck supper, a Thanksgiving treat for a neighbor…or just a little surprise for your family! 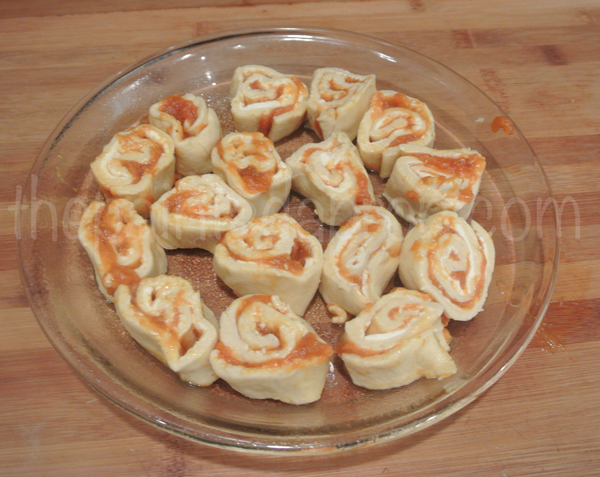 The best part about these spiral bites of nutty pumpkin is that they are super quick to make! These are the ingredients I started out with. 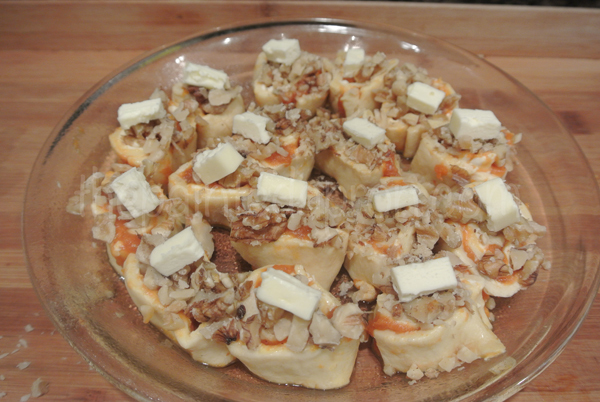 I was basically planning to make a recipe on my Bucket list this month, Pumpkin Croissants. After studying the recipe I decided I wanted to change it. 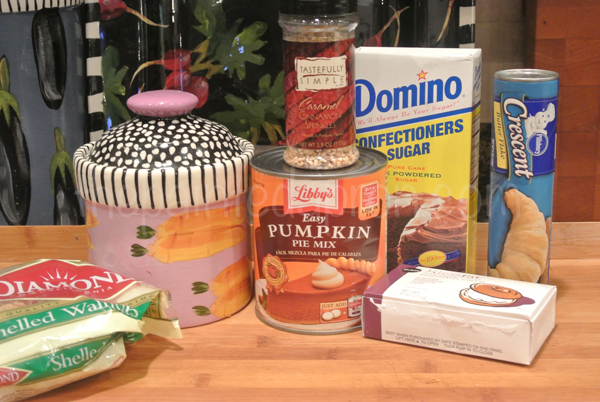 The recipe I had called for canned pumpkin, and I bought pumpkin pie mix. 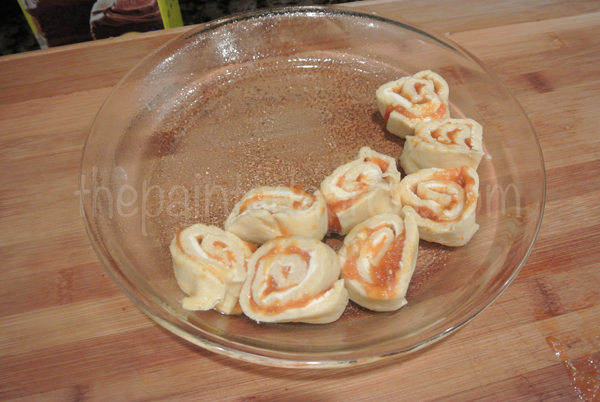 It also rolled the crescent roll dough the traditional way and rolled them in sugar. I axed all that and went my own way. Just ignore the Confectioners Sugar and the Cinnamon sprinkles because I didn’t use them. 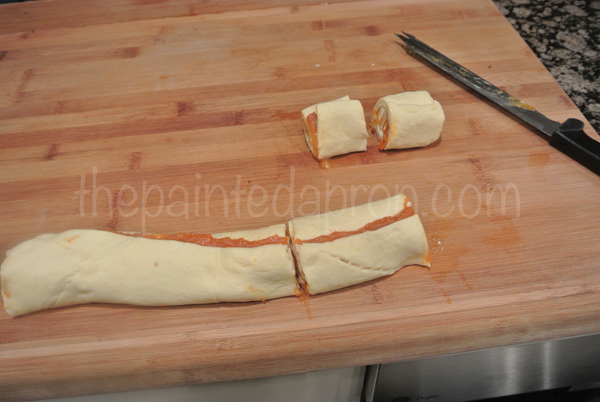 Carefully open the crescent roll can and try to remove it without separating the pieces. 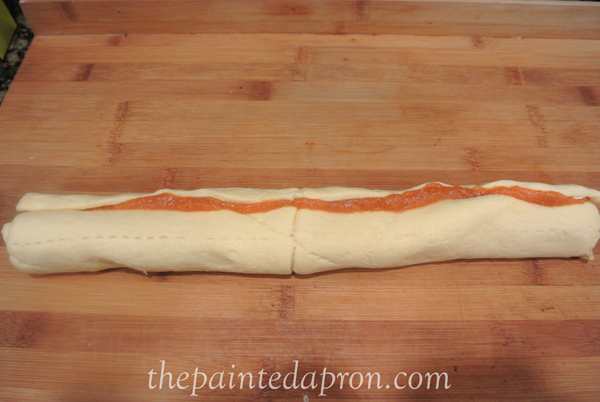 Roll out the dough into 1 large rectangle and pinch the preforations to seal if necessary. 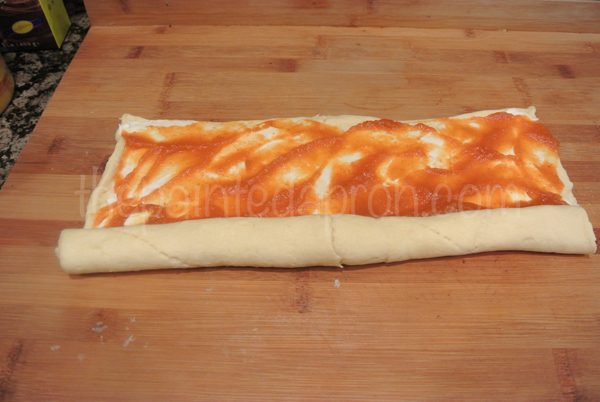 Spread evenly with a thin layer of cream cheese. Sprinkle sugar lightly over cream cheese. 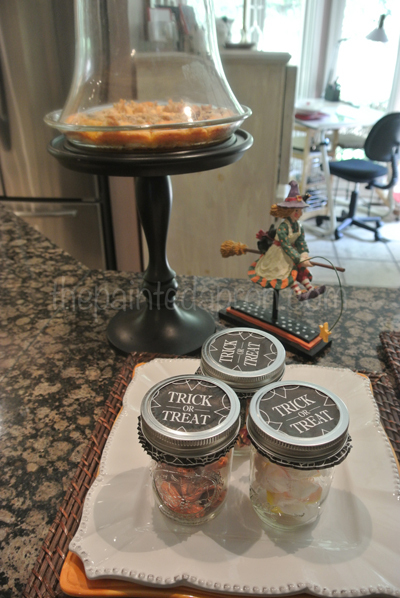 I used white granulated sugar but next time I will use brown sugar,I just didn’t think of it until later. 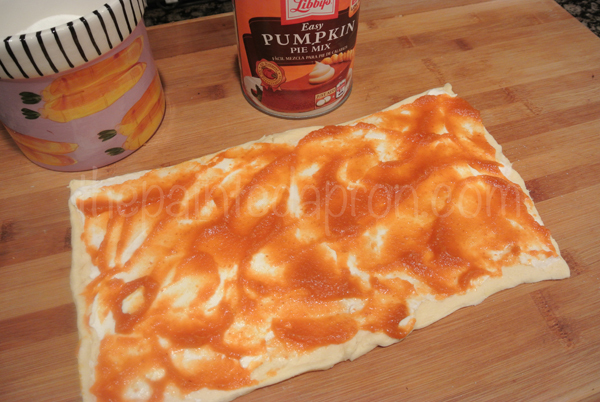 Then spread a thin layer of Pumpkin Pie Filling over dough. Since I knew I was going to roll this up, I purposely restrained myself, I was tempted to really pile it on! 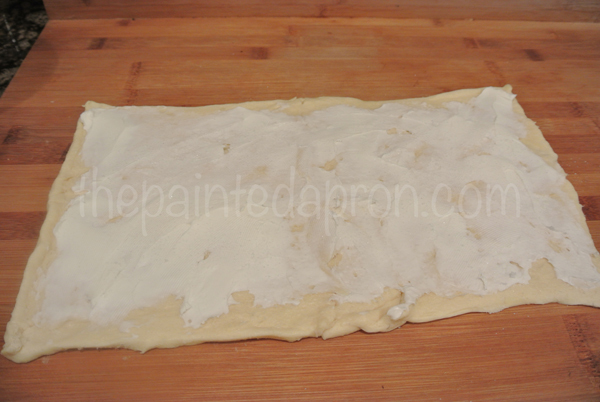 Slowly begin rolling the dough trying to keep the seams from separating and keeping the roll even. 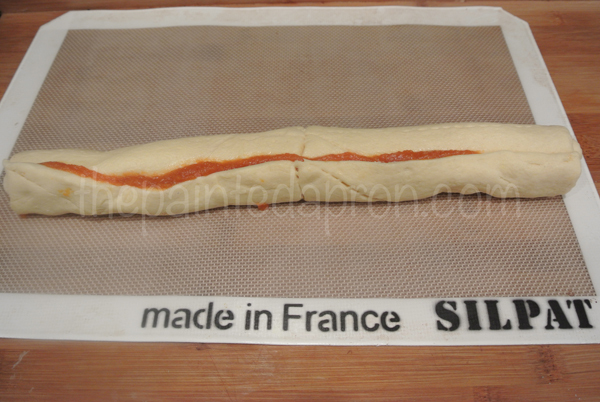 I got out my handy dandy silpat [baking mat] and just eased the roll onto it. 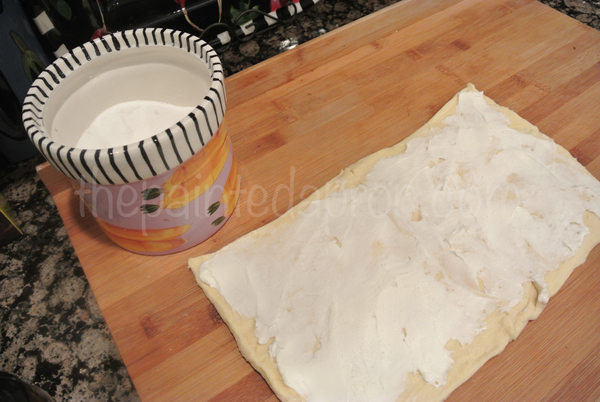 You could use a towel, wax paper or foil here- then I gently placed the rolled dough into the freezer for a few minutes to make it easier to handle. After about 10 minutes in freezer [or cover roll and put it in the refrigerator for several hours] Slice the log into 16 pieces. 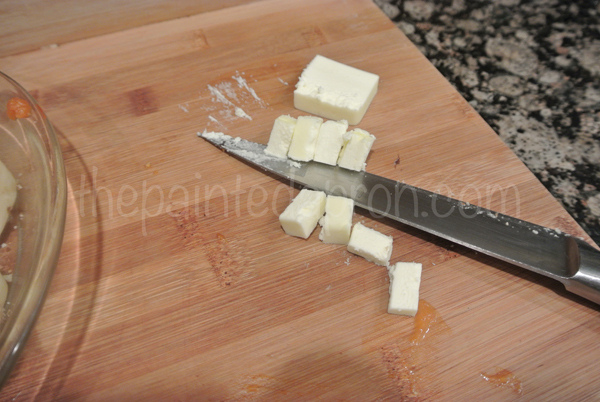 Begin at the center and cut in half. Then cut the halves into 1/4s and then cut the 1/4s in half again and you will have 16 even spiral slices. Let cool completely before separating. 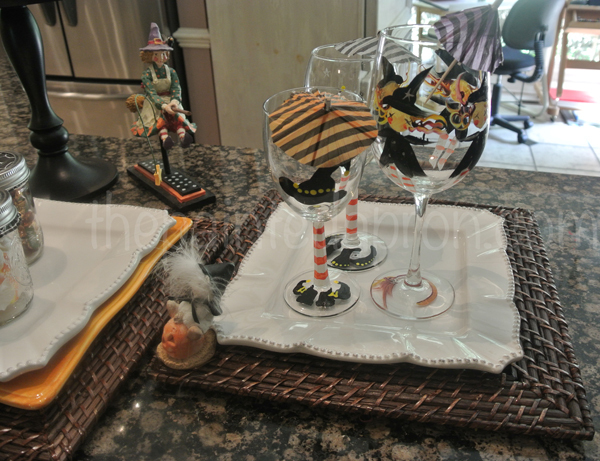 with some witchy wine glasses, everything is set! 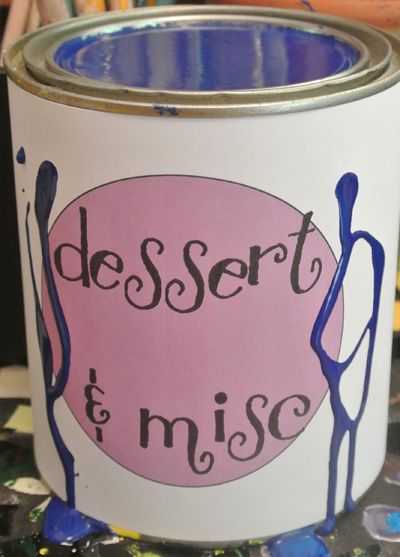 This recipe would make a great GIFT FROM THE KITCHEN! These look delicious! I will have to try them, thanks for sharing! 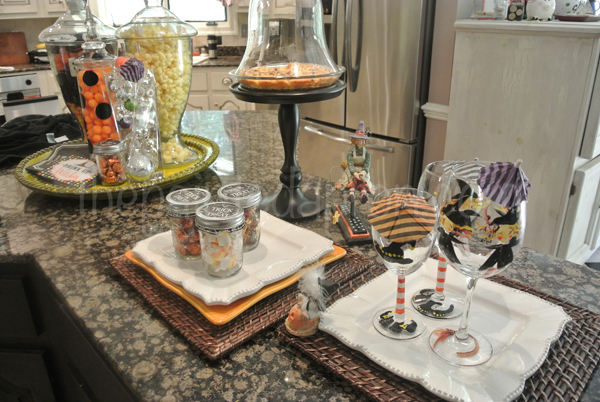 Thanks Audra, they are super easy! I like your tree with the grapevine and lanterns, can’t believe it’s time to think Christmas! Why am I reading this early in the morning – before breakfast? 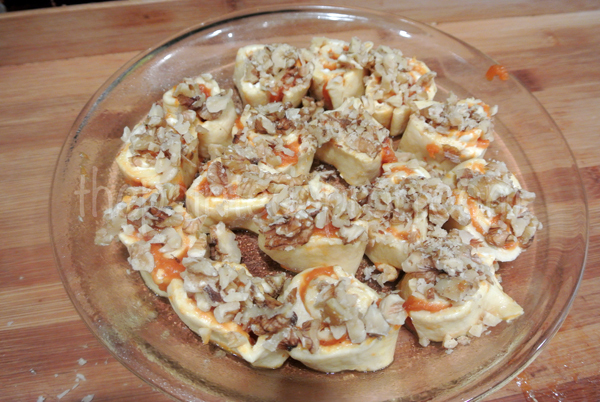 Now I’m really hungry for your pumpkin walnut spirals! I will definitely be making these in the near future. Thanks for sharing at Throwback Thursday! Thanks Alli! These are good any time of day! These looks delicious! Thanks for sharing at Throwback Thursday. 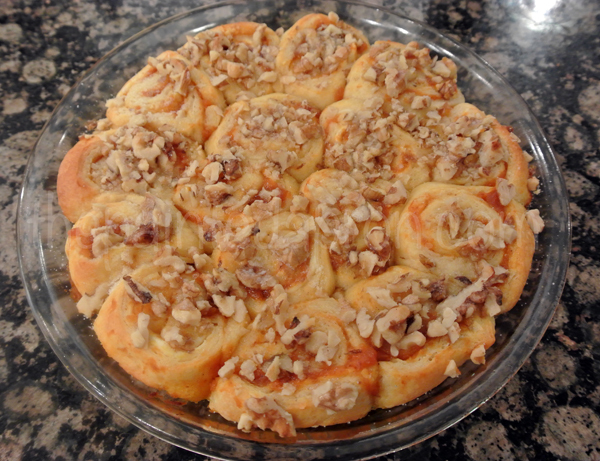 Now you know that I have Cresent Rolls just ready for your awesome Pumpkin Walnut Spirals, thanks so much for sharing this recipe with us. 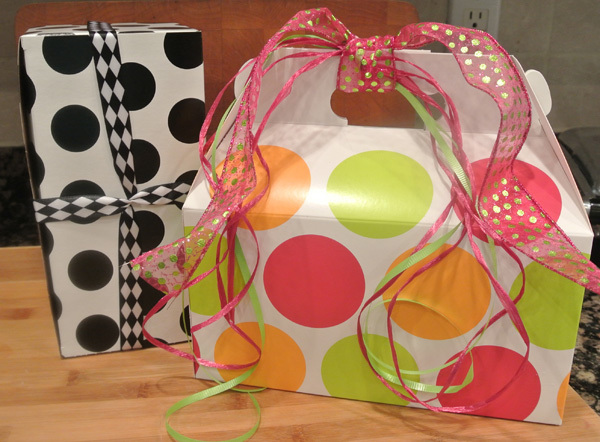 Hope you will come back to see us at Full Plate Thursday real soon and have a great week!